When looking for a therapist, it’s important to find someone who not only has the right kind of training and experience, but also someone with whom you click. Therefore, when we first speak on the phone, please feel free to ask any questions that will help you determine how we might work together. We will also discuss my fee schedule, hours of service and the details of your insurance plan. And if for some reason we are not able to make an appointment for you, then I will see if I know of other therapists who may better meet your needs. By the end of the call, you should have a good idea of how well we match up. It’s a good idea to arrive about 10 minutes early to your first appointment so that you will have time to fill out the paperwork before we meet. 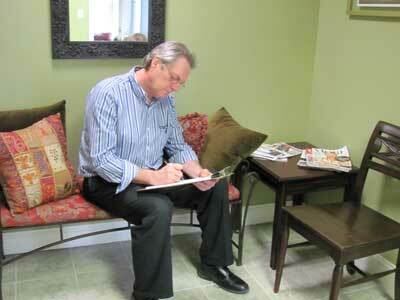 I will leave a clipboard in the waiting area with information about my practice, including a confidentiality agreement and intake form for you to fill out. The first appointment is usually devoted to assessment. I’ll be inquiring about the reasons for your visit, asking about your general lifestyle, and finding out more about your background. I may ask you to fill out a questionnaire or two to help us get more specific information about what is going on in your life. If you are currently in crisis, we will of course, address that immediately and come up with something you can do right away to address the critical situation. After two or three sessions, I’ll have a good idea about what is going on in your life and how to help. At that point, while assessment is an ongoing process, there will be a shift to more active therapy. Helping you develop insight about your emotional and psychological world is crucial. But integrating those insights into real changes is where the heart of therapy lies. In our sessions you will most likely be practicing specific strategies such as cognitive restructuring, assertiveness, breathing and relaxation, mindful awareness, or communication skills. Your treatment plan may also involve home practices such as self-monitoring or reading to complement the work we do in session. The emphasis is on helping you draw on your strengths to overcome obstacles to your well-being. I will ask for feedback and continually monitor your progress until we both feel that you’ve achieved the quality of life that you seek.